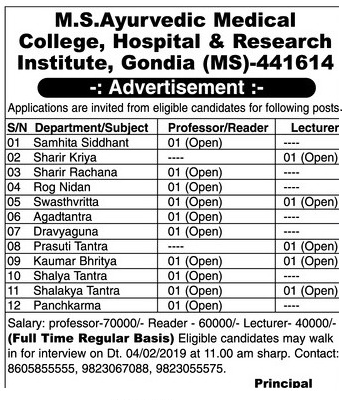 APES Gondia (MS Ayurvedic Medical College Gondia), Gondia published a new job notification for Professor/Reader & Lecturer Posts. The recruitment is for total 15 Vacancies. The willing candidates are informed to see the latest notification February 2019. Walk-in Interview on 04-02-2019. For More details of APES Gondia Recruitment 2019 Read Below. Interested & Eligible candidates may attend for walk in interview along with all the documents addressed at M. S. Ayurvedic Medical College Hospital & Research Institute, Kudwa, Gondia – 441614, Dist.- Gondia (MS)..